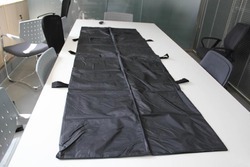 We are the leading manufacturer, exporter and importer of Dead Body Cover. To meet divergent demands of the clients in an efficient manner; our organization is instrumental in providing a comprehensive assortment of Dead Body Cover. These are used to safely cover dead bodies and are extensively demanded by hospital and mortuaries. The product offered by us is made in compliance with the industrial norms and is highly appreciated for its best quality and perfect size. In addition, customers can get these at pocket-friendly rates.